Affiliate marketing is based on a very simple concept. You share content that informs or entertains your readers. Along with your regular informational content, you also pitch products that your audience would be interested in. These are the products of other vendors, not your own, and you get a commission for any sales you make. You promote, customers click and buy, and the vendor pays you for the sale. Commissions may be a flat fee (e.g., $25 per signup) or they may be a percentage (e.g., 50% of the sale amount). They may be one-time or recurring. When you promote a product or service that has a recurring charge, such as a membership site, you may get paid every time the customer you referred makes a payment. Commission percentages on digital products (e.g., ebooks and many courses) are typically higher than commissions on physical products (e.g., electronics). You can get started selling affiliate products by joining an affiliate network, such as Clickbank, JVZoo or CommissionJunction. Vendors differ in their policies, commissions, and requirements and on a network you can browse products and find the terms for selling those products. The network system makes it easy to connect with vendors and start selling quickly. It also can mean you get paid sooner. Many affiliate programs have a minimum payment amount. They do not issue a payment until you have earned that minimum, perhaps $50 or $100. If you are in several programs, each offering just a few products that you promote, it can take a while to hit that minimum. But in a network with products from many vendors, it can be much faster. One of the oldest and best-known affiliate programs is Amazon.com’s. Although their commission percentage is fairly low, they have several things going for them. First, they sell an incredible variety of products. If they don’t have anything that your market would want…well, what is wrong with those people? Additionally, Amazon is good at converting browsers to buyers. They provide a lot of information for customers looking to make a decision (e.g., reviews, photos, detailed product descriptions) and they know how to recommend additional products. One of the cool things about Amazon’s affiliate program is that you can send someone there through a link to a $5 product but while they are there, Amazon shows them a sale on big screen televisions. If they buy one, you get a commission on the television! I have gotten commissions on everything from Puma sneakers to powdered peanut butter to pink furry handcuffs(!) and I had not linked to any of those items. Finally, it is easy to get started with Amazon Associates. You will need a website that is up and running, and it should have some good content and not be overrun with ads. A human will look at your site before approving your application. There are rules about where you can place Amazon Associate links and other aspects of program participation, so get familiar with them. Want to get started with Amazon? Go to https://affiliate-program.amazon.com/ to apply. The key to success with affiliate sales is not the size of your audience, but how well the products or services you offer meet their needs. You really need to know your readers well and understand the kind of help they need, and then match this to the products available on the network. For example, if you have a recipe blog, you could add affiliate links to ingredients or cooking equipment when you post a recipe. If you have a large and responsive readership but offer products that are not entirely relevant to them, you may get a smattering of sales. But quality is more important than quantity. It’s much better to offer the right product to the right audience, even if the numbers aren’t massive. Don’t assume that you will just join a bunch of affiliate programs, throw some flashing banners on your site and start raking in the dough. You need to choose products that are right for your audience, products in which you believe (and ideally use yourself) and you need to present them to your audience in a way that lets them know why they should buy. The key is to be transparent. Let your audience know that you are recommending this product because you’ve used it and you thought it would help them. You can write review blog posts, or simply put your own plug for the product on the sidebar of your site. Most programs allow you to promote using social media, so you can post it to Facebook, Tweet it out or put a photo and a link on Instagram or Pinterest. Avoid making a hard sell as it could turn off your readers. And don’t promote anything that you’re unsure of. 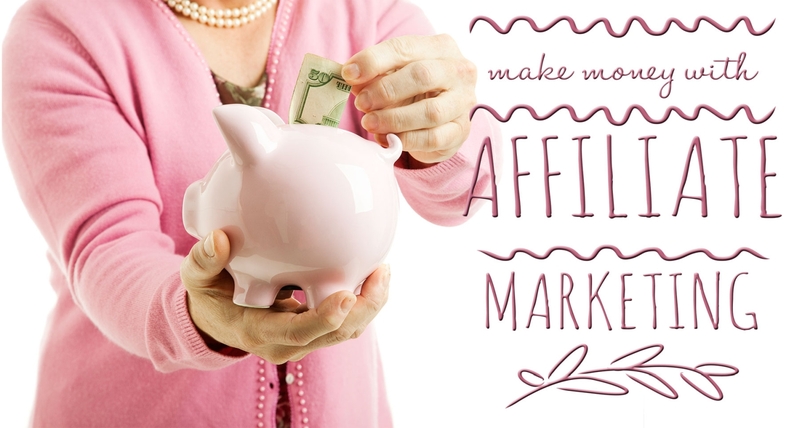 Like any other monetization strategy, affiliate marketing depends on your audience and the strength of your content. It works best when you already have a loyal and engaged following, and as your following grows, so can your income. great post on affiliate marketing…i love using clickbank which has lot of products from different category and also pays high commission on each sale…you have written a very helpful article…thanks for sharing…!!! What if you run Google ads on your website? Can you still be an Amazon affiliate at the same time?